In case you weren’t aware, fat is back. So much so, it seems, that the latest health food trend involves adding the solid stuff to your morning coffee, and even former World Barista Champion Matt Perger of Melbourne’s St Ali is singing its praises. Butter coffee is being revered as an all round ‘miracle cure’ and touted as the answer to weight-loss, mental acuity and appetite control, and it’s gaining popularity worldwide. 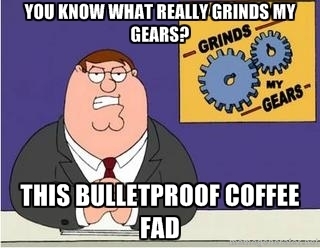 Just ask David Asprey, American health and lifestyle entrepreneur, who’s made big business from the brew, which he’s coined bulletproof coffee. Asprey makes his by brewing coffee with filtered water, then adding a coconut-oil-based supplement – ‘brain octane’ – before the mandatory 1-2 tablespoons of ‘grass-fed, unsalted butter or ghee’. He blends this until frothy, and apparently it tastes great. Oh, and not to worry, all the essentials to prepare Asprey’s signature blend are available for purchase on his website. A starter kit will set you back $37.99 – and you thought the price hike in cafes was getting excessive! It was in Tibet that Asprey was first introduced to the concept of buttery beverages, when he was ‘literally rejuvenated’ by tea-with-butter after hiking in high-altitude -10 degree weather. It’s no surprise, really; Tibetan populations have been drinking their tea and coffee with butter for thousands of years, and given the country’s extremes in temperature and altitude, they can use the additional energy. But as Nutritionist Rosemary Stanton observes, most Westerners probably don’t need any extra. But what about those alleged health benefits? 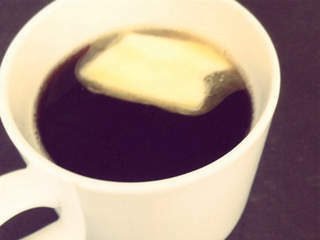 Coffee with butter may aid in curbing the appetite, simply as it’s extremely high in fat. However, the recommended two tablespoons of butter would add around 1000kj to your morning coffee – making it the equivalent of a meal in itself. There’s little evidence to suggest that any of the other purported benefits are anything more than a placebo effect. And while it seems that the only major short-term downside of downing a buttery coffee may be its impact on your thighs, is it really worth it? When it comes to taste, reviewers are somewhat divided: some proclaim butter coffee to be a most delicious, frothy latte, whereas others, as in this great article, deem it “absolutely revolting”. I’m not sure about you, but I’d much rather reap the benefits of healthy fats by adding a spoonful of nut butter to my morning porridge, maybe spread my toast with some buttery avocado or sprinkle some seeds on my smoothie. So for now I’ll be keeping the butter far, far away from my coffee, even if it is the cool thing to do. Reminds me of “the Emperor’s New Clothes” except the emperor is now the ‘foodie’ customer who is seduced by and sucked in by this latest ridiculous fad. And how is it that the more palatable addition of cream (still highly ‘energetic’. i.e. full of kJ), which is less processed than butter (just a step away), doesn’t rank? Too tasty? Not as ridiculous? Asprey et al must be licking their lips for this one. Get hiking at altitude; add yak’s fat then and you’ll seriously appreciate it. Fine piece Felicity. Haha thanks Trudy – I like that analogy! !